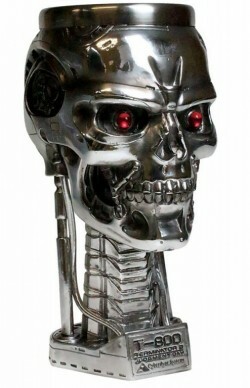 Official Terminator T-800 designed skull goblet. Nemesis Now licensed Terminator products. Taken from the original 1984 film. Made from resin for a solid and weighty display piece, with the effect of metal. There is a removable stainless steel inner cup that can be washed. The outer figurine goblet part can be wiped with a damp cloth and then dried.